Customer experience and pricing are closely linked – with the main link being customer emotions. With increasing competition – including price competition, organisations not only have to ensure customers feel good about their experience, they also have to ensure that customers feel good about the price they are paying for it. There is now extensive research – across numerous industries – to show that price isn’t nearly as important in buying decisions as people think it is. Yes, price is always a factor, but the right customer experience strategy can reduce price sensitivity and diminish the extent to which price is an important factor in the buying decision. The starting point is of course to deliver an excellent customer experience. A great experience will make people want to pay the price, they will want to justify the price to themselves and others. The more powerful their positive emotions about the experience, the more these will win out over any rational doubts or anxieties about price, value and affordability. But there’s more to customer experience and pricing than that. 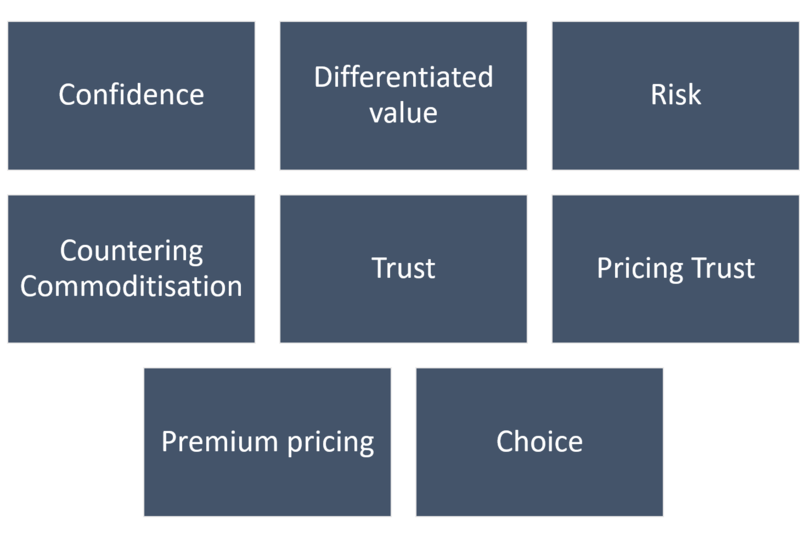 Buying decisions are nearly always a mix of the rational and emotional and there are many overlapping forces which influence how price sensitive a customer might be. The customer experience challenge is therefore to massage and manipulate these factors in the buying decision. The first step is confidence. You have to demonstrate the belief that the price you are charging is good value. I call it the Loreal principle – because you’re worth it. You have to show that you believe that you’re worth it. If you, your staff or your website display any defensiveness or lack of confidence about the price, this is saying that you don’t feel good about the prices you are charging. If you don’t feel good about your prices, your customers certainly won’t. Although they might not always put a number on it, customers sub-consciously place some sort of value on your offering and compare this to both your price and competitor offerings. In the same way that price needs to exceed costs for profits to be made, perceived customer value has to exceed price for the client to feel good about a purchase. Economists call this ‘consumer surplus’ – its the surplus benefit or profit that customers get for themselves out of any purchase. If customers can’t see the value or their perceived value/benefit from any purchase is less than the price, then they either won’t buy or it will become a ‘grudge purchase’. Many industries – including professional services – struggle with the grudge purchase factor. People buy but they don’t like it – leading to poor reputations, costs disputes and general resentment all round. For customers to feel good about the price, you therefore have to communicate the value of your offering and specifically communicate how your offering adds more value than your competitors. Link the features and benefits of your offering to the needs and value triggers of your customers (time? emotion? risk? money? situation?). Instead of customers thinking whether they can afford to pay more, try to get them thinking whether they can afford to pay less. Use effective questioning to focus their attention on the quality or service risks of either alternative offerings or deciding not to buy. An extension of the above is to ensure that a potential customer doesn’t see your offering as a commodity. This is slightly different from simple differentiation in that commoditisation refers to any customer assumptions that the final outcome (including the customer experience) will be the same whichever provider they go to. If they see your offering as a commodity, why would they pay more? The buying decision, by default, is dominated by price. If, however, the value derived from your offering is in doubt, at risk or otherwise differentiated, they have a clear reason to pay more. The building of customer trust is incredibly powerful in reducing price sensitivity. The most obvious representation of this is with referrals: when a customer or prospect is referred to you by someone they trust, some of this trust is transferred to you as a provider. This trust then becomes central to the buyer behaviour and acts to reduce the importance of price and other considerations. Trust comes in many forms. Sometimes it is earned through direct experience, sometimes it transferred through a referral or testimonial, and sometimes it comes through establishing your expert status (reassuring expertise and experience). The more you can build trust, the less price sensitive customers will be. 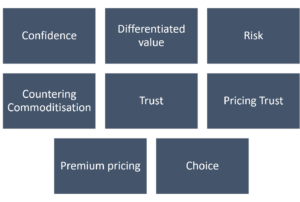 Pricing trust is different to trust overall: it is the extent to which customers believe they are being offered a ‘fair’ price. If they feel they are being taken advantage, overcharged or if the profits are too great, they will resent this and fight back by questioning the price. If they trust that you are not trying to overcharge them, and that the price is fair and reasonable, they relax about price and focus on different buyer criteria. involving the customer on decisions that have cost/price implications. Choice is good. It makes clients feel that they are in control. With pricing, choice is important because if clients are more in control of the price they pay and will therefore have no reason to resent the price they pay. They will feel good about paying a higher price simply because it was their choice (they could have gone for a cheaper option if they wanted to). If there is no choice, clients may resent the lack of control they have over the price and prefer a competitor who offers more choice. Even if they buy your offering, a lack of choice increases the risk of pricing resentment – the dreaded grudge purchase! Can people feel good about paying more than they have to? Absolutely! Many luxury brands charge significantly more than their competitors specifically to gain a reputation for being expensive – and their customers love it. The value of a Rolex watch or a Louis Vuitton handbag lies specifically in the fact that they are expensive. If they weren’t expensive, we wouldn’t covet them nearly as much or feel so smug showing them off to our friends. Pricing too low can make people doubt the quality. Premium pricing carries with it an assumption of superior quality, which is more than enough for some people ( it costs more, so it must be better! ). And then you’ve got the reassurance, status and satisfaction that comes with knowing you’ve got the most expensive. Buying the most expensive wine on the list feels fantastic. Anything less than that is a compromise. And who enjoys compromises?